Part of a sound system that provides the public with event information. Securely installed waterproof speaker system over used multiple days. A couple of horn speakers as part of a large announcement system. 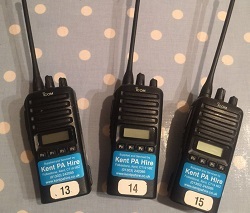 Welcome to the home of Kent PA Hire for public address (PA), radio and audio visual (AV) hire and installation services for Kent and East Sussex. We are a privately owned business and provide a reliable professional service. As well as public address hire for events, we also provide public address and hearing loop installation in churches and village halls. We hire out public address, radio communications and audio visual systems in Ashford, Canterbury, Eastry, Tilmanstone, Folkestone, Sandgate, Hythe, Margate, Broadstairs,Chatham, Ramsgate, Dover, Deal, Sandwich, Romney Marsh, Maidstone, Medway, Hastings, and East Sussex. 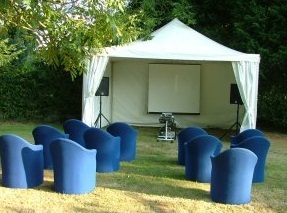 For outdoor events, we have mobile commentary boxes and trailers designed especially for this type of function. The commentary box has a worktop, and seating, as well as all the equipment needed for the event. We run our amplification from a battery power supply, and only use generators when essential. 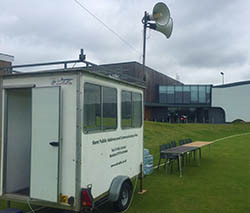 We also have trailer masts available to ensure site wide radio communications at your event. Take a look at our Testimonials page for our customer comments and reviews. 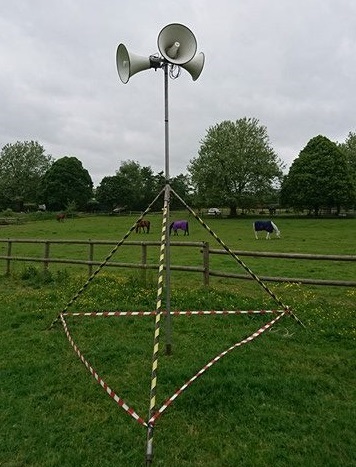 We are very busy during the spring / summer season providing public address and communications for equestrian events across Kent and East Sussex. We can provide sound coverage over a wide area for your shows, as well as large quantities of Radios abnd repeaters. Headsets for commentary are also available. All systems have their own power supply and can be booked with or without a commentary unit. As we often have multiple shows every week, please do book as early as possible. Our regular vintage weekend will take place on the first Bank Holiday in May. From this weekend through the season we are very busy with events each weekend, with school productions, conferences, meetings and sports days during the week.